Adverse mood changes and fluid retention are very common in the days just prior to a menstrual period. such problems are vexing and can be difficult to treat but are a result of normal hormonal variations during the menstrual cycle. 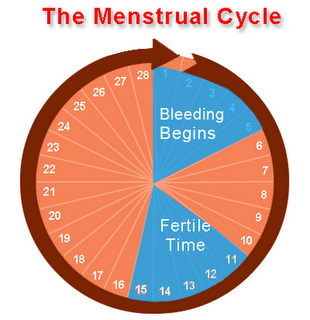 the menstrual cycle varies from woman to woman. periods may be regular, irregular, light, heavy, painful, pain- free, long, or short, and yet still be normal. the rhythm of a menstrual cycle is medically less significant than bleeding, pain, or discharge between periods.only when problems are severe or recur for several months is medical attention required. the doctor can find such problems as endometriosis- the presence of the soft of tissue that line the uterus in other parts of the body, where it can cause problems, emergency treatment is seldom needed. We believe that diuretics (pills that help the body get rid of fluids through increased urination) and hormones are rarely needed. as we have said in other pages of this blog, we prefer the simple and natural to the complex and artificial. we have all too frequently seen hormone treatment lead to mood changes that are worse than premenstrual tension, and diuretics lead to potassium loss, gouty arthritis, and psychological drug dependency. salts tends to hold fluids in the tissues. the most natural way to start fluids move is to cut down on salt intake. in the U.S, the typical diet has ten times the required amount of salt. many authorities feel that this is one cause of high blood pressure and arteriosclesis. if you can eliminate some salt, you may have less swelling and fluid retention. if food tastes flat without salt, try using lemon juice as a substitute. commercial salt substitutes are also satisfactory. products with the word "sodium" or the chemical symbol "na" anywhere in the list of ingredients contain salt. For menstrual cramps, use ibuprofen like advil etc, naproxen or aspirin. products claimed to be designed for menstrual cramps (such as midol) now have ibuprofen as the main ingredient. many patients swear such compounds, and they are fine if you want to pay the premium. we don't understand why, on a scientific basis, they should be any better than plain ibuprofen or naproxen is usually most effective, but sometimes aspirin or acetaminophen may be preferred. Is the problem premenstrual tension or fluid retention? Has the bleeding been heavy for several months? Is the pain severe, and has the pain failed to respond to home treatment? 1 comments for "Home Treatment: Difficult Periods"